I remember waking up almost every morning to my mama reading her Bible on the couch. I was completely fascinated by the whole thing–the special colored pencils, the special black pens that she had a never-ending supply of, the pictures and notes she drew in the margins. 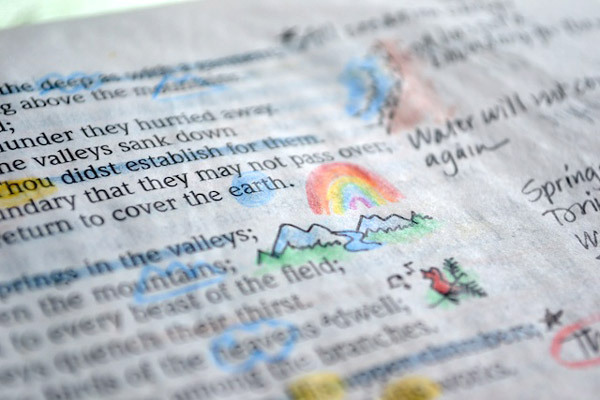 We’re not very alike, but the fact that she drew rainbows in her Bible is a good indicator that we’re related. 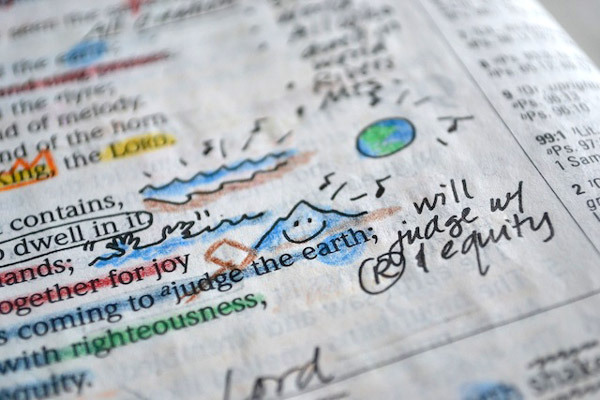 I, of course, aspiring to be like my mama and to do this amazing Loving the Bible in a Hands-On Way thing, wanted to draw my own pictures to illustrate what verses were talking about. 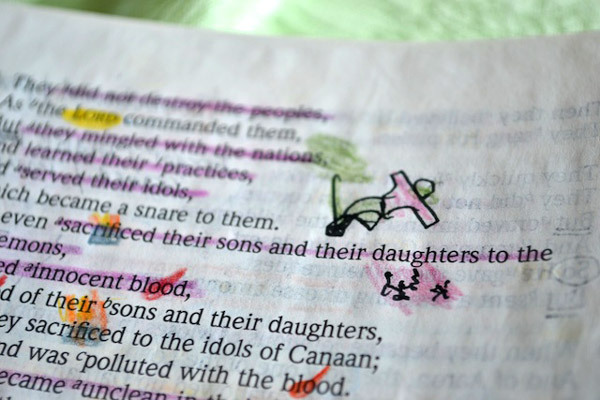 I can’t believe she let me (I would be way too possessive of this gloriously loved and colorful Bible to let grubby little kids possibly mar it with vague scribbly stick figures). I love that it wasn’t just the example of her reading her Bible every morning, but also her including us as she really loved God’s word. 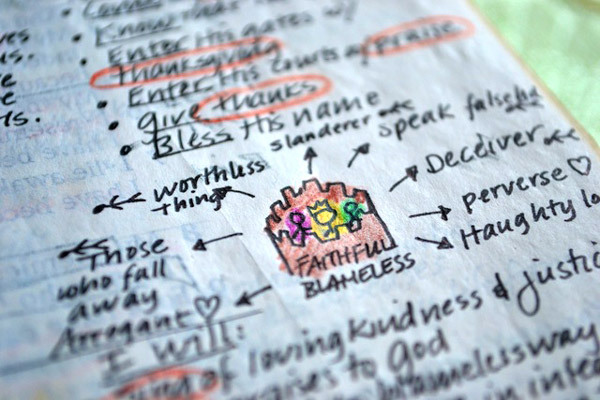 This has definitely been an influence in my highlighting and red pen all through my Bible. I’ll never have a Bible as artistic and beautiful as my mama’s, but I hope to read it over and over again and love it to death a little bit like she does. Thank you for sharing this. 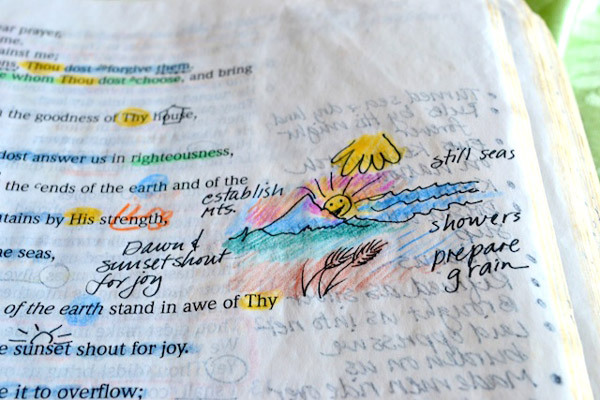 I love how she connected with the Word and drew the pictures…so beautiful. 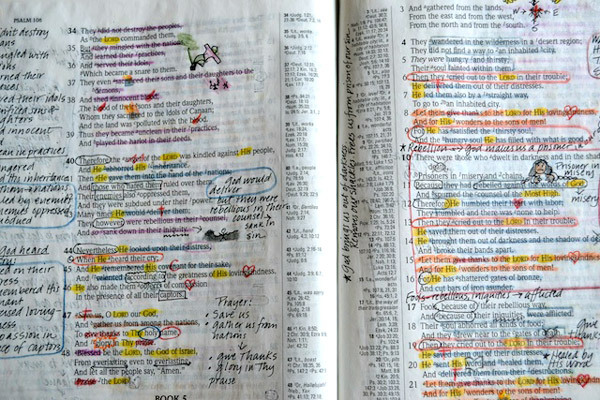 Reminds me of my mother's bible minus the beautiful art and color. My moms bible is written and underlined all over. It is a cherished keepsake. Wow!! Pretty amazing! 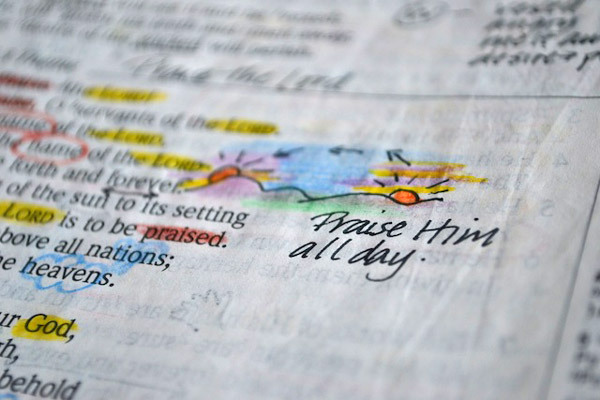 God is so good and with the help of the Holy Spirit we can understand the bible. 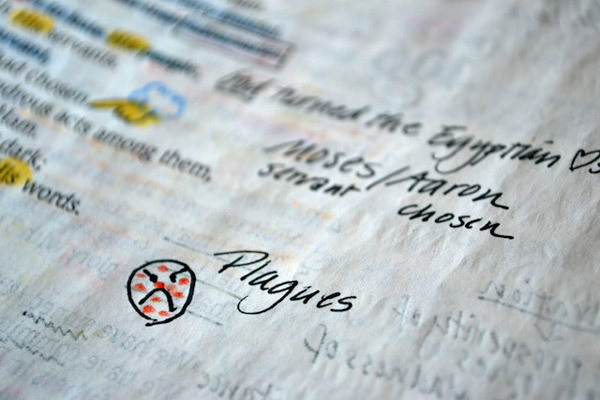 Her writing is amazing too! An inspiration to me. =) thank you for sharing.